(Nanowerk News) Elevated or diminished eye pressure impairs our ability to see, and in the worst cases, can even lead to blindness. Until now, there has been no effective long-term treatment. In response, Fraunhofer researchers are developing an implantable microfluid system that can efficiently and durably stabilize intraocular pressure. Glaucoma and phthisis bulbi are incurable, insidious diseases of the eye. While glaucoma impairs the normal effluence of internal eye fluids, thereby elevating intraocular pressure, phthisis bulbi refers to a condition in which the eye produces too little vitreous humor. The eye begins to collapse upon itself: this is why it is sometimes referred to as atrophy of the eyeball. In either situation, the affected patient may experience severely impaired vision and possibly even blindness. Contemporary treatment approaches definitely attenuate disease progression, nonetheless they are effective for only a certain period. In glaucoma, for example, a surgeon creates an additional, artificial effluence from inside the anterior ocular chamber. The problem: in about one out of every four patients, scarring occurs after the procedure that impedes drainage of intraocular fluid. By contrast, in phthisis cases, the physician injects fluids like hyaluronic acid into the eye at regular intervals - an unpleasant procedure that still cannot prevent blindness in the immediate or distant future. Researchers at the Fraunhofer Research Institution for Microsysems and Modular Solid State Technologies EMFT are working on a new approach to therapy: working jointly with several SMEs, they are engineering an active implant that is intended to efficiently and sustainably regulate eye pressure under the aegis of the MICROAUG project, under the KMU Innovativ Program sponsored by the federal ministry for education and research (BMBF). Geuder AG is spearheading the plan. The implant consists of a micro-pump system, a sensor-based pump control, an integrated battery for solid state energy supply as well as a telemetry module for data transmission. 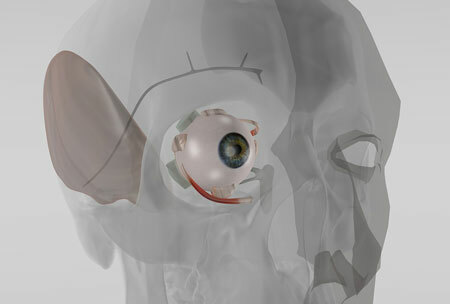 It can be attached directly to the eyeball: “Naturally, the patient should not sense it and his or her eye movements must not be restricted in any way,” Jenke clarifies. The system components therefore had to be miniaturized. The Munich-based researchers developed a tiny (just 7x7x1 cubic millimeters), biocompatible silicon micro-membrane pump with a production rate of 30 microliters per second (maximum). Depending on the disease, it can moisturize the eye or drain intraocular fluid. Fraunhofer experts use the eye’s natural drainage pathways so that no scar tissue forms. Monitoring at regular intervals, based on a conventional eye pressure measurement ,the attending physician can set the volume of fluid to the desired level on an outpatient basis. Currently, the partners are building a functioning demo model that meets all quality specifications with respect to space, energy management, pump control and micro-fluid management on the laboratory scale. Additional reliability and lifecycle testing are pending. Another job item is the hermetically sealed emplacement of the micro-pump chip onto the implant’s titanium housing.